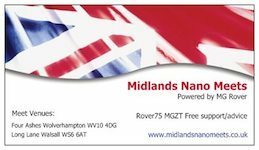 After the success of the last Nano meet at the Four Ashes in September, and following requests by members to arrange another asap we have settled on Sunday 16 October. For those that want to meet up for breakfast we can go to a local truckstop before the meet gets started say at 9am. Starts at 10am Ã¢â‚¬â€œ 10.30am Ã¢â‚¬â€œ finishes not much before dark usually. The tea urn will be on all day fired by a genny and I will provide tea/coffee/milk/biscuits for you to help your selves as and when. 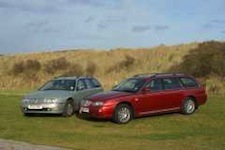 We cannot guarantee so will have gazebos to put the cars on to work under if we need to. The area where we normally work on the cars has been completely untouched by the development work so we will be in the usual place. I expect the usual arrangement of me taking the padlock off the entrance gates but keeping them shut so as not to get any unwelcome visitors, so when you arrive you may need to open the gates and close them after entry. If there are any more developments I will keep you posted on this thread. If you are coming please post on here and say if you want to be included for breakfast, then nearer the day once we know numbers we can sort out a meeting place. Last edited by raistlin on 15 Oct 2011, 14:36, edited 9 times in total. Last edited by raistlin on 26 Sep 2011, 07:26, edited 1 time in total. Sorry, she is useless with a spanner - but is a superb welder. Hope to be there - however, in the process of selling and buying a house and will hopefully exchange very soon so this may mean that we are frantically packing and cannot go out to play. hoping to be there going to see if i can get corin to sell me the rear screen chrome surround and clips as its soaking in the boot and i have eliminated everything else so could do with some guidance on fitting,what times brekkie? mark d3 wrote: hoping to be there going to see if i can get corin to sell me the rear screen chrome surround and clips as its soaking in the boot and i have eliminated everything else so could do with some guidance on fitting,what times brekkie? OK Mark, I'll annotate the OP accordingly There is usually an honesty box for the food payments. Rear screen trim just clips in, so long as the clips aren't broken. However that in itself doesn't provide any kind of seal. If it is leaking from there, it will need some work on the screen itself. That is NOT a Nano job. Getting one out is no big deal. Applying the adhesive for the replacement is NOT fun. It makes cleaning an EGR (Exhaust Gas Recirculation Valve) look like a clean room job. Duncan wrote: Rear screen trim just clips in, so long as the clips aren't broken. However that in itself doesn't provide any kind of seal. If it is leaking from there, it will need some work on the screen itself. That is NOT a Nano job. Getting one out is no big deal. Applying the adhesive for the replacement is NOT fun. It makes cleaning an EGR look like a clean room job. Look forward to seeing you Andy OP annotated. I will be there with plenums, lidl covers,and some compensators of which one as your name on it am also doing trebor's Robs a few more have taken interest too cheers Arctic. Arctic wrote: and some compensators of which one as your name on it. I will do my best to get there. Don't know what time, but will bring tools again. 80 - 90% chance of being there at some point though, Walsall is nearer for me than 4 oaks. BADLAD wrote: I will do my best to get there. Don't know what time, but will bring tools again. 80 - 90% chance of being there at some point though, Walsall is nearer for me than 4 oaks.